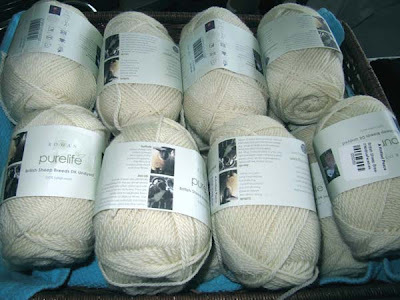 I've pulled out this basket of lovely undyed yarn, Rowan's purelife "British Sheep Breeds DK" in #780 Bluefaced Leicester It's time to start this new project as it has been in my head and partially on paper for some time. It's time to get the stitches onto the needles. I'm naming this sweater The Carmichael Aran as it's a gift for someone. Check out Dennis' amazing artistic skills by clicking here. I'm in awe.